In 2018, Cleary Gottlieb hosted a wide array of heritage month celebrations that featured distinguished speakers. The celebrations afforded opportunities to broaden awareness, heighten the level of discussion, and bolster the culture of inclusion at the firm. They helped to nurture an environment where members of the firm can interact and engage in thoughtful dialogue about contemporary topics that are critical to the success of a multicultural and global law firm. 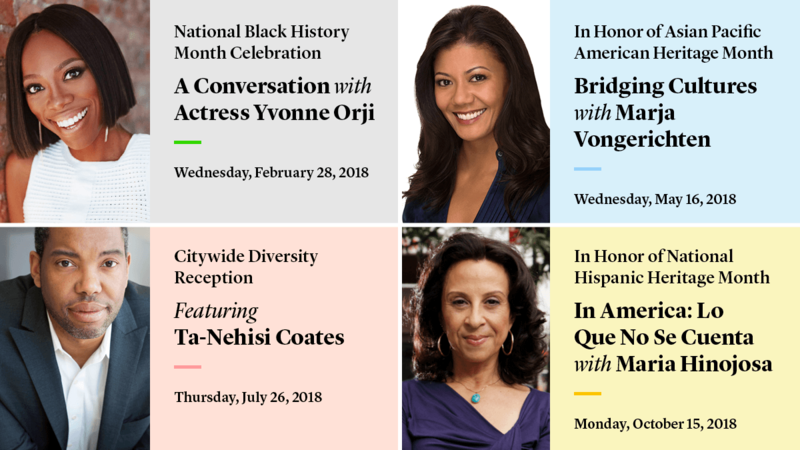 Cleary hosted its annual Black History Month Celebration, a conversation with actress Yvonne Orji, best known for her role as Molly on HBO’s critically acclaimed series Insecure. Cleary hosted its annual Asian Pacific American Heritage Month Celebration, “Bridging Cultures” with Marja Vongerichten, host of PBS’s TV series Kimchi Chronicles and author of the companion cookbook, Kimchi Chronicles: Korean Cooking for an American Kitchen. Cleary, in partnership with the Hispanic National Bar Association, hosted its National Hispanic Heritage Month Celebration, “In America: Lo Que No Se Cuenta,” with award-winning news anchor and reporter Maria Hinojosa. Learn more about diversity and inclusion at Cleary.